Показания Хайдарова: Измайловская преступная группировка, Махмудов, Черный, Малевский, Козицын, Бокарев. One British and five Irish companies which owned in 1999-2010 different parts of the Ural Mining & Metallurgical company and are connected with its enterprises, belong to a network that leads to an international criminal system of money-laundering and financial fraud. FIRST BALTIC COMMERCIAL TRUST ( in 2001-2002 owned 11,6% of JSC «Safyanovskaya Med’», 14,6% of «Serov Metallurgical Plant» and 10,2% of JSC «Bogoslovskoe rudoupravlenie»). KNIGHTSVIEW CORPORATION – the UMMC sells its production partly using this company (22,3% of the total receipts in 2001). One of the UMMC owners Eduard Chuchlebov was in 1999-2001 head of the «Knightsview corporation» representative office in Moscow. All these companies exist under the direction of Philip Burwell, who is believed to having created an international network of money-laundering, which covers dozens of countries. This example will help to understand the connections between these companies. The Irish ROTEX INDUSTRIAL LIMITED became part of the UMMC in 1999, when it was founded. In 2002, following the order of Iscander Makhmudov, it received first 11% of shares, then 18%. In the list of owners of Rotex Industrial Limited there are companies controlled by nominal directors which helped to withdraw funds out of Russia and CIS acting together with the Latvian Parex Banka and closed dozens of international criminal deals. LUXCO 2000 LIMITED, the secretary of ROTEX INDUSTRIAL LIMITED, was directed by Stan Gorin and Erik Vanagels , while SUMMERGLEN LIMITED and GRACEWAY LIMITED were under the control of Company Services (A-Z) Limited, directed along with the others by WILLIAM CURRAN, who controlled a network of companies, directed by the same nominal people. Heads of the Сyprian director of Rotex Industrial Limited — Jargon Management Limited – are also Stan Gorin, Erik Vanagels, Vivianne Beatty and the others. Stan Gorin, Erik Vanagels, Voldemar Spatz, Juri Vitman, Danny Banger are involved into a number of criminal cases, which are connected with a fraud sсheme of tax refund in Russia. During the investigation of this sсheme a lawyer Sergei Magnitsky died in a Russian prison. In Magnitsky case an English company Nomirex was mentioned, which received money from a number of Panamian firms, directed by Stan Gorin and Erik Vanagels. In 2011 Nomirex, directed by Stan Gorin, Erik Vanagels, Voldemar Spatz, Juri Vitman, Danny Banger in the name of the corporation “Chernomorneftegaz” paid the pseudo-British company Highway Investment Processing LLP 400 million dollars for a Singapore boring rig. According to a Ukranian newspaper «Zerkalo Nedeli», the price of the rig was $248,5 million and the swindlers made a clear profit of $150 million. Vanagels and Gorin are also involved into the case of Ex.UA together with the Panamian company Cascado AG, where Gorin and Vanagels are also nominal directors. At the same time Cascado AG owned another Panamian firm – Waterlux AG, which owned a ship “Faina”6 captured by Somaly pirates on its way to Kenia in 2008, when it turned out, that there were over 30 tanks T-72, launchers and AA mounts on board. The names of these nominal directors are connected with corruptive scandals in the Yanukovich family. An English company “Navimax Venture Limited” owned the LLC “Architectural and construction company ‘Technopromservice”. Three items of property of the Yanukovich family in Crimea were registered to “Technopromservice” which for many years has been the co-founder of another family structure – LLC “SPS Group”. “SPS-Group” was a stockholder of the biggest Ukranian shipping enterprise “Lemtrance” and one of the co-founders of the association “Donbasski rasshetno-finansovii centr”, which united a number of coal enterprises in the Donets Basin, that received huge public contracts from the government. 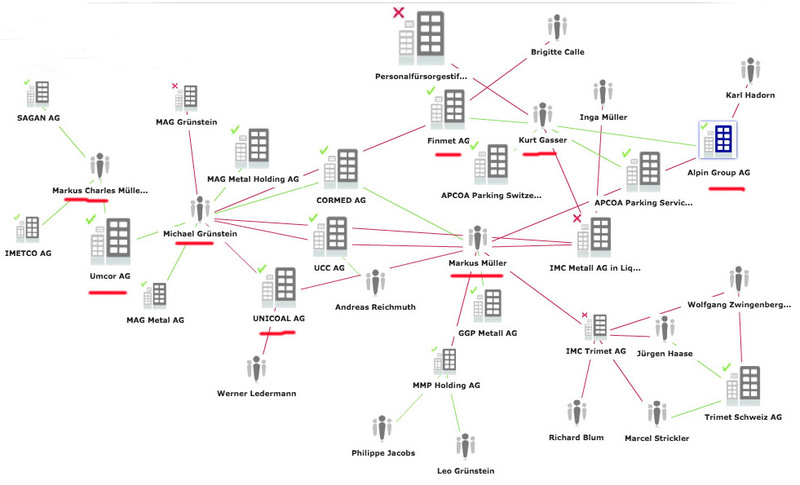 All these assets are also believed to be connected with the Yanukovich family. “Navimax Venture Limited” is registered in London in Queen Anne Street, 48 – the same address as the ex-owner of the UMMC ROTEX INDUSTRIAL LIMITED; the director of “Navimax Venture Limited” is the above-mentioned Danny Banger and the Cyprian Fynel Limited which in May 2012 belonged to Stan Gorin and before that – to Eric Vanagels, Petr Zika, Juri Vitman, Danny Banger. Owners of ROTEX INDUSTRIAL LIMITED mentioned in the IPO prospectus of the UMMC are two Panamian funds Freeworld Development Foundation and National Consulting Foundation. They registered in Great Britain over twenty firms with the same directors and companies that lead to the above-mentioned British-Irish criminal network. These two Panamian funds own companies that are controlled by almost all above-mentioned criminal directors. 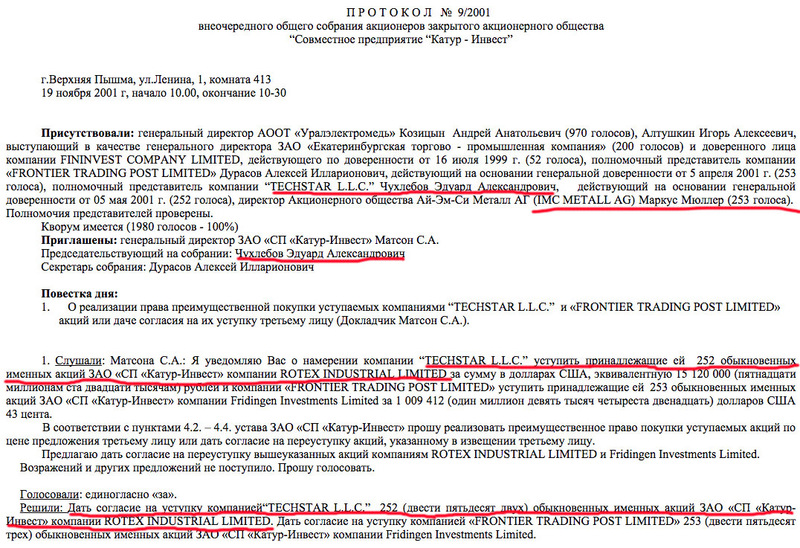 For examle Freeworld Development Foundation owns MAINLINE SALES LIMITED, and its directors are Fynel Limited, Daniels Banger и Jargon Management Limited which might be a sign of a connection between Iskander Makhmudov and fraud schemes of the Yanukovich family. In fact the same fund owns assets controlled by Fynel Limited which is the head of the owner of the corrupted Ukranian «Navimax Ventures Limited» and partly disposes of shares of the UMMC. In the reports of «Navimax Ventures Limited» FIRST BALTIC COMMERCIAL TRUST, KNIGHTSVIEW CORPORATION, NORTHERN IMPEX RESOURCES LIMITED, Nash Investments, PACHECO HOLDINGS LIMITED are mentioned as debtors of the UMMC that are regularly in debts. In the 2001 annual report these debts exceed 9 million dollars. (In the early 2000-s the UMMC quits Pacheco Holdings and Nash Invesment, Pacheco Holdings was controlled by Iskander Makhmudov through BLONDE INVESTMENTS CORPORATION LIMITED on the Cayman Islands and Nash Invesment belonged to D.K.K. Development & Research Foundation, registered in Lichtenstein and controlled by Oleg Deripaska and Michail Cherny. 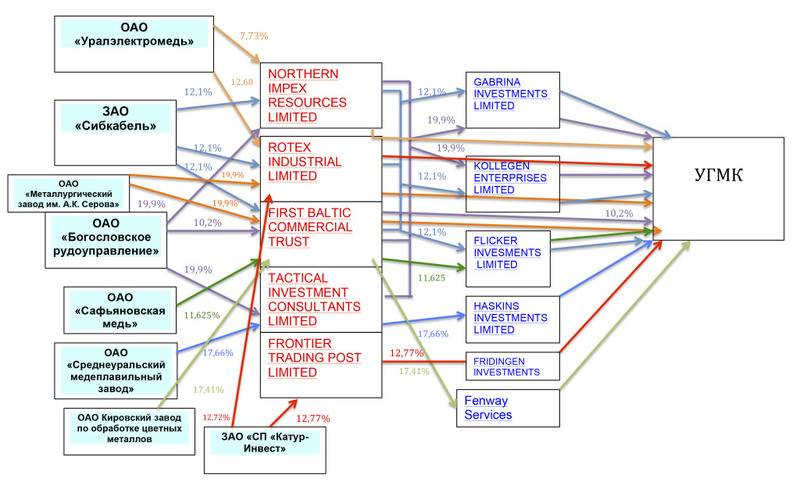 In 2001-2003 the shares of some enterprises controlled by the UMMC are combined by conducting them through the same companies of the British-Irish criminal network: ROTEX INDUSTRIAL LIMITED, FIRST BALTIC COMMERCIAL TRUST, TACTICAL INVESTMENT CONSULTANTS LIMITED, NORTHERN IMPEX RESOURCES LIMITED, FRONTIER TRADING POST LIMITED). In 2002 “Uralmed” shares, registered to PACHECO HOLDINGS LIMITED, owned by BLONDE INVESTMENTS were bought by the Cyprian SWANSON GLOBAL SERVICES LIMITED. The director of SWANSON GLOBAL SERVICES LIMITED is a Bulgarian citizen Martin Marinov, who was called by the Spanish police the creator of the money-laundering network which involved along with the others the affiliate company of the UMMC Vera Metallurgica. Let’s go back to the UMMC structure to follow the way of some shares, connected with the Irish network. In 2001 some “Kotur-Invest” enterprises controlled by the TECHSTAR L.L.C and the above-mentioned Eduard Chuchlebov joined together with ROTEX. 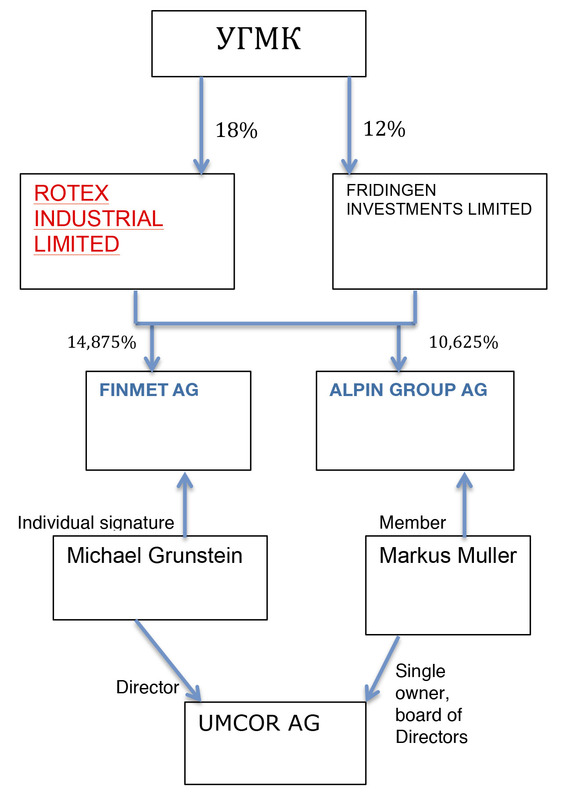 In 2003 the UMMC shares controlled Rotex Industrial Limited and Chuchlebov go over to the Swiss companies: Alpin Group AG – 10,625%, Finmet AG – 7,4%. So Chuchlebov controls Alpin Group AG which has the same directors with the UMMC’s biggest trader Umcor AG, a big European nonferrous industry enterprise. Finmet AG also gets his part of the Fridingen Investments Limited, controlled by Andrey Kozitsin, and its share in the UMMC rises up to 19,9%. 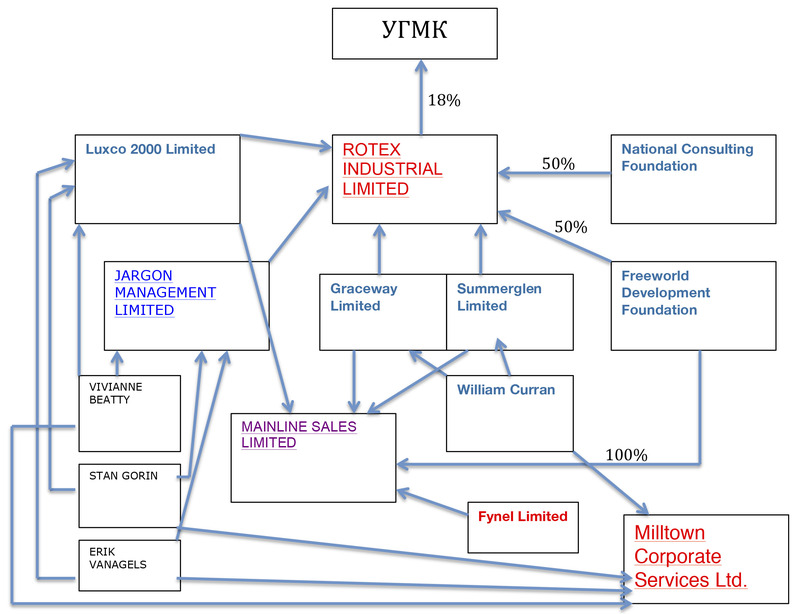 In 2003 some UMMC shares from Rotex Industrial Limited, involved together with some international criminal firms went over to Swiss companies, connected with big European nonferrous industry enterprises. Later, in 2007 the UMMC became owner of Alpin Group AG after its 15% shares went over to Chuchlebov’s Talberg. In 2007 the property in the UMMC of a Swiss Finmet AG was devided between the newborn Koilton Services Limited and the already existing FRIDINGEN INVESTMENTS LIMITED controlled by Kositzin. Alpin Group AG, Finmet AG and Umcore AG have a number of the same owners, including Grünstein Michael and Markus Charles Müller. Markus Muller belonged to the CJCS “SP Katur-Invest” direction board and owned some shares of the enterprise through IMC Metall AG. IMC Metall AG is controlled by the same managers as Alpin Group and Umcore AG: Gasser Kurt, Grünstein Michael, Müller Inga, Müller Markus. The same directors (Müller Markus и Grünstein Michael) controlled in different time a coal trader UNICOAL AG which had some contracts with Glencore on the surety of “Kuzbassrasrezugol” of the UMMC. It is worth saying that the above-mentioned directors are not nominal: they control less than 10 firms which have many different connections. Umcor AG also owns Montanwerke Brixlegg Aktiengesellschaft where Chuchlebov belongs to the direction board. In 2013 the buying by the UMMC 10% of Montanwerke Brixlegg Aktiengesellschaft was officially announced. This enterprise together with A-Tec Minerals and Metals Holding GmbHc belongs to an Austrian syndicate. A-Tech Industries AG was devided in 2010. A-Tech Industries is famous for its fight for a Serbian mining enterprise RTB Bor, which worked together with a copper tubes maker Fabrika Bakarnih Cevi, owned by Alpine Group. UMCOR AG also owns a Slovenian copper enterprise Kovohuty, a.s and a French Gindre Group. 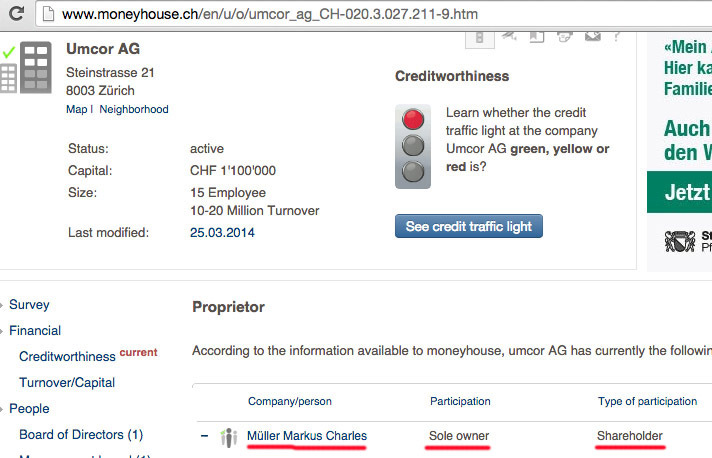 UMCOR has a single owner – Markus Muller. Markus Muller who runs several enterprises owned by the UMMC makes his own decisions and depends on the decisions of the company’s top managers. This picture shows how in 2001 Chuchlebov and Markus Muller registered the UMMC shares to the criminal Rotex Industrial Limited whose facilities later went over to the Swiss companies controlled by Markus Muller and then to the European non-ferrous industry enterprises. That is how big sums of money led through Irish off-shore companies legally go over to European enterprises controlled by Iskander Makhmudov and other UMMC owners. The UMMC top-manager Eduard Chuchlebov, who used to control Rotex Industrial Limited, turns his share into real property in the oldest Austrian metallurgic enterprise. There are also reasons to believe that Umcor is affiliated with Glencore, who works closely with Iskander Marhmudov’s enterprises. For example in 2005 the UMMC stands surety for Umcor AG in front of GLENCOR AG for 400 million dollars. Having such a big network of affiliated enterprises the UMMC has a possibility to avoid some European duties by selling its production in the name of these enterprises. In August 20013 a Serbian activist of a trade union movement Rato Ninkovich spoke about such a scheme involving Serbian Fabrika Bakarnih Cevi. All these circumstances and responsibilities establish the foreign market focus of the UMMC that once became cause for concerns of the Federal Antimonopoly Service that in 2010 found Competition Law violation (article 10, part 1, paragraph 8) in the activity of the UMMC and the Chelyabinsk Zinc enterprise controlled by the UMMC. They were accused of creating discriminatory barriers for Russian consumers comparing to the European consumers of copper and zinc, produced and delivered by the UMMC and the Chelyabinsk Zinc enterprise. Похищение России | При поддержке Mantra & WordPress.